Living Runes provides a thorough examination of the Norse runes that will challenge the experienced rune worker to deepen his or her understanding of these mysteries. The book begins with an explication of the story of Odin, the Norse god who won the runes by sacrificing himself on the World Tree. It continues by examining each of the individual runes in turn, both the Elder Futhark and the lesser-known Anglo-Saxon Futhorc. Each rune is studied not only from a historical viewpoint but also from the perspective of a modern practitioner. You will be introduced to the practice of galdr as well as the magical use of the runes and the proper way to sacrifice to them and read them for divination. Most importantly, the book specifically addresses the runes as living spirits and provides guidance on developing a working relationship with these otherworldly allies. 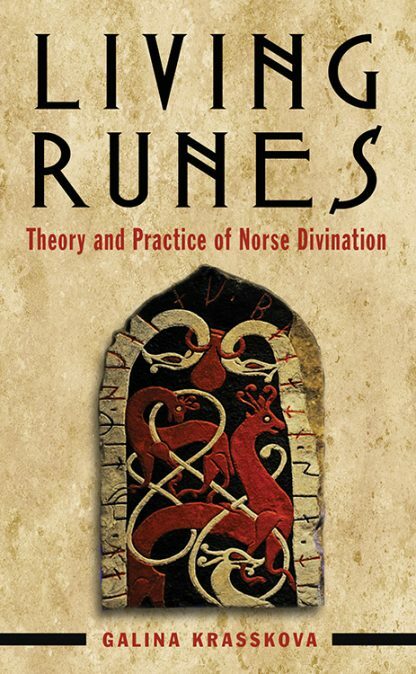 Note: Living Runes was previously published as Runes: Theory and Practice (New Page, 2009) but for several years has only been available from Lightning Source via Ingram. Replaces ISBN 978-1-60163-085-8. Galina Krasskova is a free-range tribalistic heathen, who has been a priest of Odin for more than a decade. Her primary interest is heathen devotional work, and she has written and lectured extensively on the subject. Galina is a Northern Tradition shaman currently residing in New York.